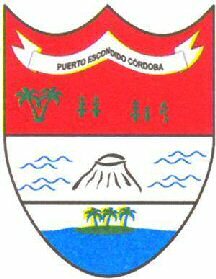 The flag of the Municipality of Puerto Escondido in Department of Cordoba, Colombia, is presented at <www.cordoba.gov.co> [Dead link]. Puerto Escondido aptly means "hidden harbour". At English Wikipedia page, a flag image is given, and it is a 2:3 white and dark blue horizontal bicolor. The coat of arms is not shown on the flag, as usual for Colombian subnational flags, but it is included in our page, although not the same exact version as in the Wikipedia article. Unfortunately the archived page (http://web.archive.org/web/*/http://www.cordoba.gov.co/cordoba/puerto_escondido.html) does not work at all. However, the official website for Puerto Escondido has been relocated here. The official website also has an entry on the official symbols of the Municipality, which can be accessed through here. The coat of arms and the flag are featured. The flag was designed by a group of teachers of the Escuela Urbana San Pio X (Saint Pius X Urban School) which is the location of I.E. (Institución Educativa, Educational Institution) Puerto Escondido. It is common place for Municipalities to have (at least) two official versions of the flag: the plain flag witouth coat of arms, and the flag with the coat of arms. 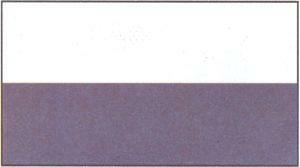 The image of the undescribed flag there is 5:8, but as the flag is not pictured straight, I'm not sure about the flag. White over dark blue.